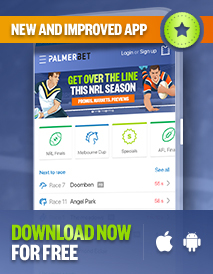 Palmerbet is 100% Australian owned and operated. We are licensed by Racing NSW and OLGR and financially guaranteed by the NSW Bookmakers Co-operative. 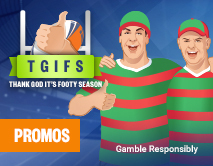 Palmerbet offers a huge range of betting markets on Australian and International Racing, American Sports, Aussie Rules, Rugby League, Soccer, Tennis plus loads more. 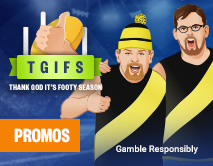 Palmerbet's gambling operations are governed by its Responsible Gambling Code of Practice and for South Australian residents by the South Australian Responsible Gambling Code of Practice. For Gambling Help visit www.gamblinghelp.nsw.gov.au or www.gamblinghelponline.org.au or call 1800 858 858. Don’t chase your losses. Walk away. Gamble responsibly. Guarantees a win dividend equal to the highest win dividend of all 3 Australian totalisers + Starting Price (SP) as declared by the jurisdictions official price (ie NOP, SAOP VOP, QOP) where available, otherwise the VOP will be used. For each way bets, the place portion is paid at middle tote. This product is the best of the 3 Australian TAB prices. For each way bets, the place portion is paid at middle tote. Pays the best price fluctuation determined by the jurisdictions official price (ie NOP, SAOP VOP, QOP) where available, otherwise the VOP will be used. Note Top Fluc bets may be subject to deductions if there is a scratching. Top Fluc betting will be provided up to 35 minutes before a race. Guarantees the highest dividend of the Top Fluctuation and the Best Tote Dividends. For each way bets, the place portion is paid at middle tote. The amount that can currently be withdrawn from your account. Any difference between this and your balance may be due to recent deposits or bonus bet turnover requirements. For more information on turnover requirements please see our promotional terms and conditions.